As one of Vienna's coolest places to dine, the Labstelle is famous for its rural and regional cuisine. The products are all from Austria and mostly pruduced in a biological way what is kind of rare in today's days! Slow Food instead of the fast bites. Well, this does not apply to the service which was outstanding in each and every way with an attentive eye, being always with us when we were looking for another order. Empty water bottle? Not at this wonderful restaurant - also the amazing and must-try Signature Gin Tonics were served before we even finished the actual glass! Something that was quite cool to watch were the guest crowd. Mostly groups of either men or women were visiting this restaurant, but not together. Like speration or a friend's get together - what we found a nice idea and will be copying as well, altough we don''t have such cool restaurants in Innsbruck. Focussing on the food: After the server took note of our orders, we were served excellent bread with a wonderful spread. A bottle of water arrived without hesitation (even free of charge and that's a sign of guest appreciation) before our excellent (!!) Gin Tonics arrived - of course we did not stay with one round. As soon as we were starting our evening conversations, a nice amuse arrived. Pickled herring with a herring salad - a wonderful start into this exciting dinner. After we finished enjoying the amuse bouche, the starters arrived. 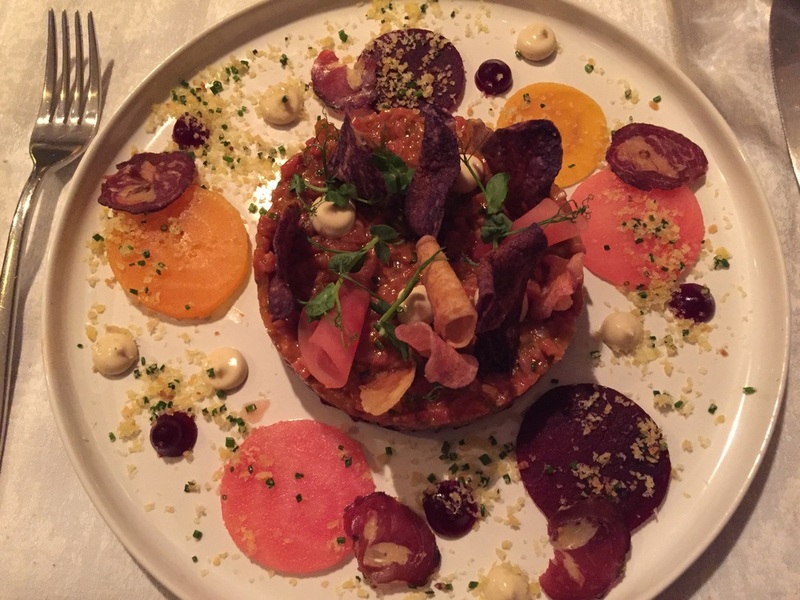 I ordered mouth-watering beef tartare with lots of accompanying things, such as beetroot and truffled majonnaise. The taste was really excellent and as you can see it could have easily been a main course in terms of size. Before we were served our main courses, the server recommended a wonderful glass of Riesling which was the perfect pairing to a great and enchanting evening and of course the main course: I had boeuf bourguignon with potatoes, wonderful sauce, onions and spinach. All in all the complete evening was wonderful and we really enjoyed this wonderful restaurant with its cozy and warm atmosphere, above all the excellent quality of the food. The value for money was really good, for this location in the centre and the service was excellent even for Austrian standards! We were guests of the Restaurant Labstelle, however all above written expresses my own opinion and has not been influenced.